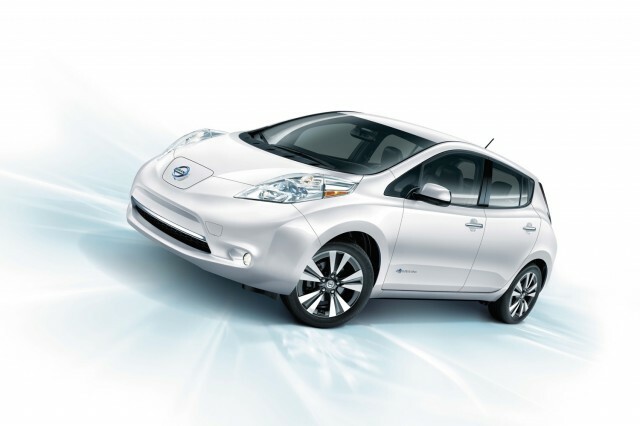 It's been almost six years since the Nissan Leaf electric car debuted in December 2010, as a 2011 model. That makes the current-generation Leaf fairly old by industry standards. Nonetheless, the Leaf rolls into the 2017 model year all but unchanged as Nissan prepares a redesigned second-generation model for launch at some future date. The most significant change for 2017 is that the 30-kilowatt-hour battery pack introduced for the 2016 model year is now officially standard on all trim levels. This larger pack was previously offered only on the Leaf SV and SL trim levels, while the base Leaf S started the 2016 model year with the previous 24-kWh pack, and was quietly upgraded later. 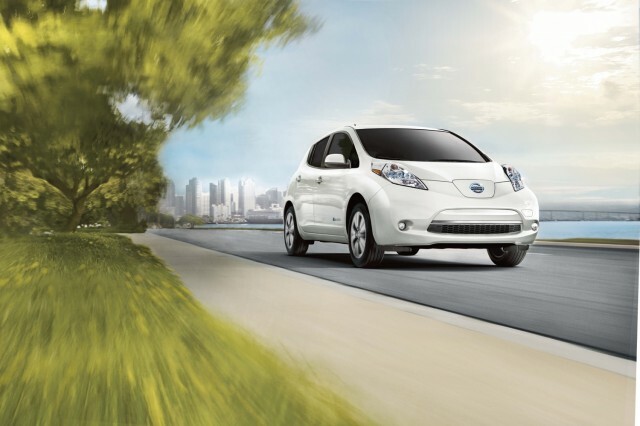 With the 30-kWh pack, the Leaf gets an EPA-rated 107 miles of range. All Leaf models continue to use an 80-kilowatt (107-horsepower) electric motor, which also produce 187 pound-feet of torque. 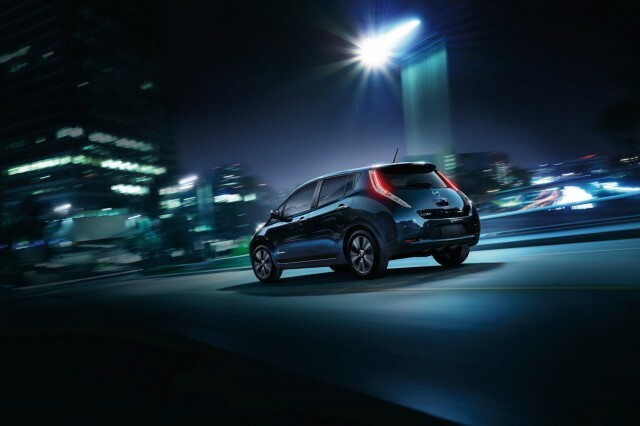 Drive is to the front wheels, and the Leaf has an EPA efficiency rating of 112 MPGe combined. Leaf S models come standard with a 3.6-kW onboard charger; a 6.6-kW charger is optional on that model, and standard on the higher-level SV and SL. A full charge from a 240-volt Level 2 AC sources takes around 7 hours with the 3.6-kW charger, and around 6 hours with the 6.6-kW charger, according to Nissan. DC fast charging—using the CHAdeMO standard—is also standard on the SV and SL and optional on the S.
As before, this allows an 80-percent charge in 30 minutes, according to Nissan. The Leaf S models continues with a fairly basic level of standard equipment, including 16-inch steel wheels, automatic climate control, and a rearview camera. 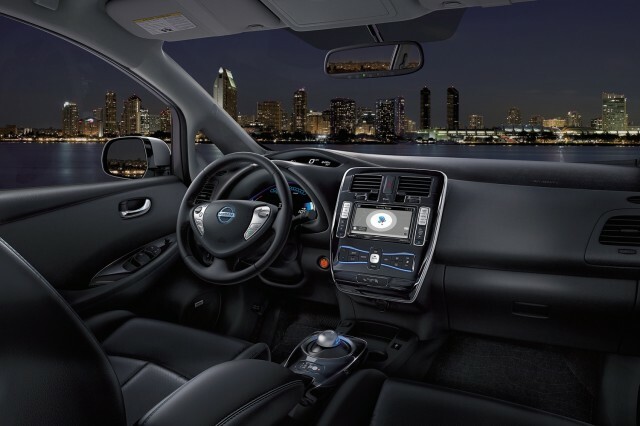 Upgrading to the Leaf SV nets features like 17-inch alloy wheels, NissanConnect infotainment system with a 7.0-inch touchscreen and navigation, heated exterior mirrors, and a heated steering wheel. The Leaf SL adds a photovoltaic solar panel on the rear spoiler, automatic LED headlights (low beams only), leather seats, and an auto-dimming rearview mirror, among other features. In addition to the standard equipment, Nissan's Around View Monitor surround-camera system and an energy-efficient Bose audio system are optional on the SV and SL models, as part of a package. Pricing for the 2017 Nissan Leaf starts at $31,545 for the Leaf S, addition of the 30-kWh battery pack having pushed that model over the $30,000 barrier. The Leaf SV and SL start at $35,065 and $37,655, respectively. All prices include an $865 destination charge, but do not include any federal, state, or local electric-car incentives that may be applied to purchases. It's worth noting that Nissan has been offering healthy discounts on the aging Leaf, so while all models now have a base price over $30,000, buyers may be able to knock that down with some negotiating. A second-generation Leaf is expected to be unveiled and launched over the next year to 18 months, most likely as a 2018 model, to replace the current model. So far, Nissan hasn't released any information about the new model, but at least one version is expected offer a range of roughly 200 miles to compete with the 2017 Chevrolet Bolt EV, rated at 238 miles.